OTTAWA - It's been two months since the House of Commons rejected a controversial abortion-related motion, but Conservative MPs are using a tried and true parliamentary tool to keep the issue alive. Petitions on abortion have been filed at least 20 times by Conservative MPs — Lawrence MacAulay of the Liberals has also presented one — since the Commons voted down a controversial backbench motion to study the definition of human being in the Criminal Code. Following question period, MPs have the option to table petitions from their constituents on almost any issue. Many of the petitions go much further than Conservative MP Stephen Woodworth's motion, which called on the government to strike a committee to study the issue of when a child is considered a child. On Sept. 27, the day after Woodworth's motion was voted down, Alberta MP Leon Benoit presented a petition that asked Parliament to "enact abortion legislation that restricts abortion to the greatest extent possible." Benoit said Monday he's proud to speak up for those in the pro-life community. "It makes a real difference to them knowing that somebody is standing up for them in the House of Commons, letting their position be known," he said. "It has some impact, but minimal, but it's one of many tools that you use. For me, I use a variety of tools to try to promote change to that legislation in that area." Many of the other petitions have asked MPs to amend the Criminal Code to reflect that life begins before the moment of complete birth. MPs sometimes stand and table several petitions at once — earlier this month, Alberta MP LaVar Payne presented nine of them, all in support of Woodworth's motion. "I think every time citizens speak there's an impact, and I think it's necessary that we continue to discuss — it's part of our democratic traditions that we have a respectful dialogue," said Woodworth. "Most Canadians are part of a consensus in support of those democratic ideals and they want Parliament to be part of that consensus too." The House of Commons manual of procedure and practice states that MPs are not bound to present any petition, nor does presenting a petition signify an endorsement. Still, MacAulay is the only non-Conservative to table an anti-abortion petition since the Woodworth motion was voted on. MacAulay voted in favour of the motion. On that day, 15 Conservative and two Liberal MPs presented petitions in favour of the motion and eight NDP MPs presented petitions against. Woodworth's motion was defeated by a vote of 203-91, with 10 cabinet ministers voting in favour. Prime Minister Stephen Harper has said unequivocally that his government will not reopen the abortion debate. But there is also a strong Conservative tradition to allow MPs to vote the way they want on issues of conscience, as well as on private member's business. 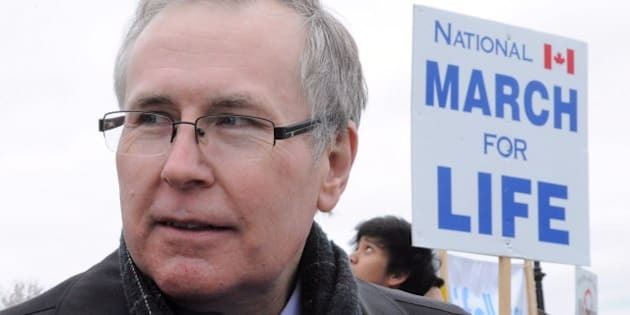 NDP status of women critic Niki Ashton equates the group of MPs pushing for curbs to abortion rights with the Tea Party faction of the Republican party in the United States. "Do petitions change legislation? No, but are they a sign of work that's happening on the ground? Yes," Ashton said. "Is it in line with worrying trends we're seeing from the Harper government on a woman's right to choose? I would say, absolutely."